I was preparing for the Make-and-Donate for the upcoming Pinterest Party at Southglenn Library April 19. I was reviewing the Operation Write Home website for current needs and decided to use a challenge as inspiration for our card. 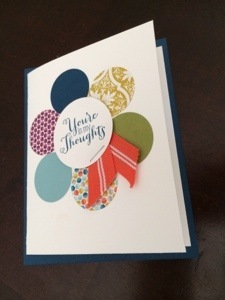 This entry was posted in Clean and Simple, OWH, Upcoming Classes on April 5, 2014 by katzcreates.